Welcome to the Fishing Experience! This is a real hands-on fishing experience! The fish are not arranged in the net in advance. Each fishing trip is unique -see which fish will be caught! Follow the instructions below for your safety. Squid ink etc. might dirty your clothes, so please wear clothes which you don’t mind getting dirty. In particular, please don’t wear white clothes or fancy clothes. Bring your own hat/cap, towel, and extra clothes to change. Life jackets (Adult/Child), Raincoats (S to XL), Rain Boots (JP size: 23cm to 27cm) and Gloves (Adult/Child). * In case of strong winds, please be aware that hats may blow away. ①Pick up rain bootsthat fit your size. To prevent sea water from entering your rain boots, don’t tuck the bottom of your pants into your rain shoes. ③Put on your life jacket. ① Please go to toilet before you get on the boat. There are few toilets on site so ideally, please use the bathroom at a hotel or service stationbefore coming. ② You will change your clothes inside the building. There are no changing rooms. Look after your own belongings. We takeno responsibility for your valuables. ③ Listen to the fishermen’s instructions carefully. * Before the instructions start, be ready with your lifejackets, rain coats, rain bootsand gloves on. ④ For everyone’s safety, the fishermen will guide you to the boat, one by one. Children go first. Please get off the boat one by one with guidance of the fishermen. Please remain seated while the boat departs, until the boatattaches to the net. * Donot sit on the sides of the boats as you may fall into the water. 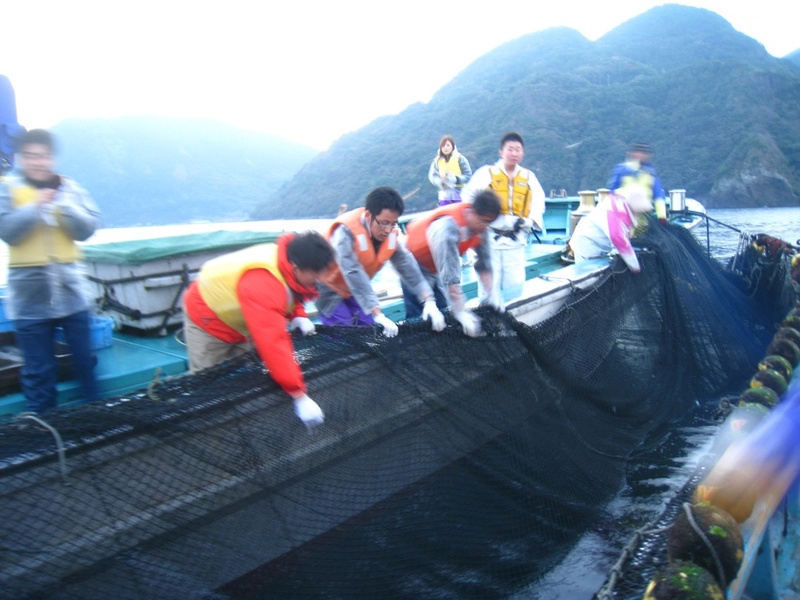 net with long bar to scoop up the fish. Be careful to nothit anyone with the bar. *Once you catch a fish, do not touch it -place it where the fishermentell you to. Don’t touch the fish that are dangerous or easily damaged. * Dangerous fish: rabbitfish, ray, lionfish and so on. * Fragile fish: bigfin reef squid, spear squid and so on. ⑧ For your safety, do not touch any machines ortools on the boat. ⑨ Please look after your small children. ⑩ Please be noted that insurance is included in the fee. *In case of fatal accident, the insurance covers up to 300,000,000 yen per person. ⑪ Please take a rest if you feel motion sickness or feel otherwise unwell. ⑫ The fishing tour takes about 1 to 2 hours. When you come back to the port, change your clothesand wash your hands etc.and be ready for lunch. Breakfast or Lunchis all-you-can-eat buffet style, servinglocal foods from the area including tempura, simmered food, baked fish, salad, pickles and more. Staff will bringsashimi (sliced raw fish) and miso soup to your table. Please help yourself torice and green tea. *Alcohol menu is available for an additional charge. ・Please pay in cash after breakfast/lunch. 30 minutes by car from Hirado Ohashito the fishing port. Copyright © 一般社団法人 平戸観光協会All Rights Reserved.